Let's dig into why this Jason Heyward 2009 Topps Chrome Red Refractor shouldn't exist, and why it does. Jason Heyward made his MLB debut on April 5, 2010.2)Jason Heyward. www.baseball-reference.com Anything released prior to 2010 is considered a pre-rookie or prospect card. According to MLB Rookie Eligibility requirements, a player must have at least 130 at-bats to be considered a rookie.3)Rookie Eligibility. m.mlb.com Jason Heyward had 520 at-bats in his 2010 campaign, which made him eligible for rookie status only during, and not prior to, the 2010 season. The 'RC' or 'Rookie Card' logo is only added after the player has made their MLB debut.4)I couldn't find a credible source to validate this claim but from experience, it's only added after the player has made their debut. The reverse side looks like any other 2009 Topps Chrome card complete with stats and copyright text. The only two items missing from the back are the card number and serial number on the top right and bottom left respectively. This 2009 Topps Chrome card features the Rookie Card logo, which as identified above, is only added after the player has made their MLB debut. Since Jason Heyward made his MLB debut the year after the release of 2009 Topps Chrome, the Rookie Card logo shouldn't be there. 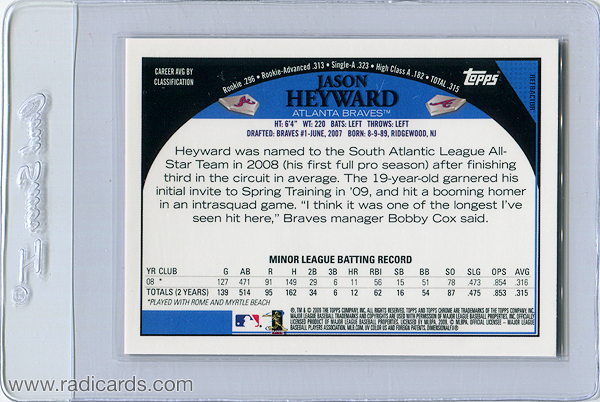 With regard to licensed products, Jason Heyward is featured in various Bowman and Topps products from 2007, 2008, and 2010. However, nothing was chronicled in 2009. So why does this card exist if it shouldn't? A. Proofing prior to final production: It's my belief this card was made to showcase the design to an internal team of Topps employees for final review. Since Jason Heyward was a highly popular prospect in 2009, it would've made sense to feature him on the card. The Rookie Card logo and the autograph area were added because those were characteristics that would eventually make it to the final official release. B. 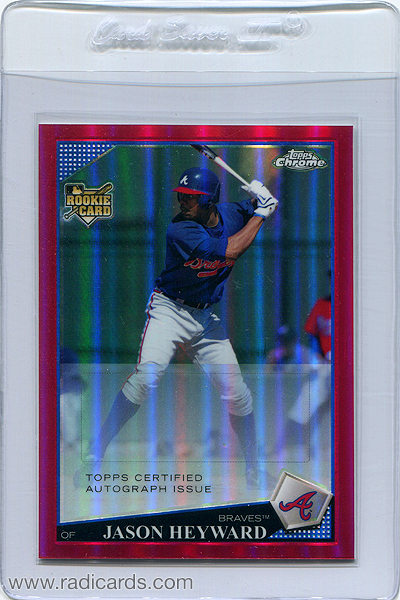 In case Jason Heyward was called up: In a conversation with some friends, one mentioned this card may have been created just in case Jason Heyward was called up prior to the official release of 2009 Topps Chrome. If that happened, Topps could've easily included this card in the set. Print Run: Unfortunately, there's no way to confirm how many copies were made. However and logically speaking, if this were a sample made for proofing, there wouldn't have been any reason to make any more than a couple copies if even more than one. Print Capacity: I'm not sure if Topps has the ability to produce just one copy of anything without producing a sheet of something i.e., Superfractors. If it's a proof, how did it make it to market? It's common for stuff like this to enter the market in one way or another. I discuss this in depth in another article. This card was likely backdoored by an employee. Knowing how popular Jason Heyward was in 2009, it makes sense to believe the Topps employee saw a profit potential in the secondary market. Who knows how much money changed hand the first time this card saw the light of day. As we can see, this Jason Heyward 2009 Topps Chrome Red Refractor is a very peculiar example and certainly one to appreciate. However, and based on the information stated, this card was likely just made for internal review for final proofing of 2009 Topps Chrome. 4. ↑ I couldn't find a credible source to validate this claim but from experience, it's only added after the player has made their debut.